“Eat your veggies” – that’s what moms usually tell their children. But with Tipco 100%, children and adults alike could actually drink the required serving of vegetables with its wide selection of veggie juices. Contrary to what you may think, these juices do not taste like vegetables at all. In fact, these are combined with the goodness of fruits for that delicious drinking experience. Aside from its good taste, these juices are high in nutrients and have no added sugar, color or preservatives. 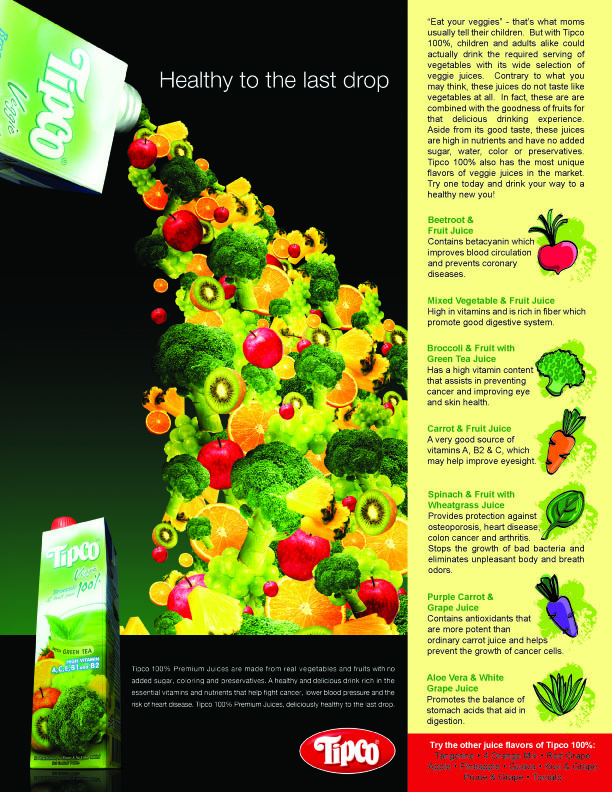 Tipco 100% also has the most unique flavors of veggie juices in the market. Try one today and drink your way to a healthy new you! Contains betacyanin which improves blood circulation and prevents coronary cancer. Has a high vitamin content that assists in preventing stomach cancer and improving eye and skin health. A very good source of vitamins A, B2 & C, which help improve eyesight. Provides protection against osteoporosis, heart disease, colon cancer and arthritis. Stops the growth of bad bacteria and eliminates unpleasant body and breath odors. Contains antioxidants that are more potent than ordinary carrot juice and helps prevents the growth of cancer cells. Promotes the balance of stomach acids that aid in digestion.